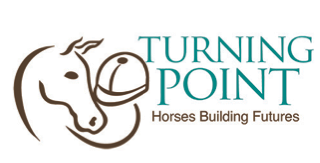 Turning Point Ranch partners the magic of horses with tools to build productive futures for people facing physical, mental, emotional or socio-economic challenges. TPR was founded in 1999 by a former Special Education teacher named Tamera Danel. In the beginning all the tack and the two horses were hers. Turning Point is one of 900 Professional Association of Therapeutic Horsemanship (PATH) International program centers serving more than 50,000 individuals with disabilities around the world. Less than a third of those centers have earned the Premier Acreditation Turning Point holds. Turning Point Ranch moved to Starr Valley Stables thanks to the generosity of Jack and Billie Hesser. YESTERDAY…. Through the generosity of Jack and Billie Hesser, Turning Point found a home for fifteen years at the Starr Valley Stables. Stalls, paddocks, both indoor and outdoor arenas, an office and tack room allowed for expanding classes and services. TODAY…Turning Point has a permanent home on 21 acres at 385 S Country Club road near 6th St. Iconic white rail fences border the property and the charming gray barn is becoming our educational center thanks to the generosity of the family of Kenneth Garrett, a longtime builder and property owner in Stillwater. FUTURE….Plans include building a covered arena with donor assistance. Grants from Stillwater Rotary, Frontier Rotary and Rotary International built a Sensory Trail onsite. A grant from the Faye Allene Brown Foundation funded the development of the Classroom and Office inside the existing barn.